Search data and insights on more than 7000 agencies. Professional and Enterprise members narrow the field in a flash using our powerful search functions. Create a shortlist in two short steps. Name your project. Add those you like straight from the search. No more spreadsheets, post-its or loose papers. Everything saved in one place. Always. Reach multiple agencies from your shortlist with our messaging tool. Send RFP's, share ideas, briefs and even attach documents. Replies come straight to your inbox. Make RFI's a thing of the past. Each agency profile already contains the information you need to do your due diligence. Meaning you're in market in an instant. Cutting down thousands of agencies to get to the few that really do what you are looking for is not an easy task. But that's what RAR is all about! A range of filters help you to narrow your search results to a digestible number. Sort the results as you please. e.g. 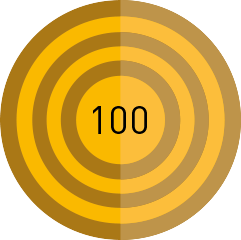 by relevance (the closest match based on your selected factors) or simply by ratings, size, awards, latest activity. Only want agencies that provide rate card details? Filter out the ones that don't. RAR allows you to swiftly identify the best agencies for your need. Simple. RAR is all about performance and transparency. And we hold ourselves to these standards. That's why our Professional and Enterprise members will see the results as they have been earned, based on the quality of an agency performance and supporting evidence only. Basic members wil see results that include agencies who have boosted their position for certain services. 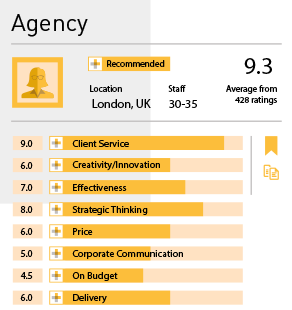 Compare apples with apples (or agencies) using the agency comparison report, a benchmarking tool that compares multiple agencies across all the key datapoints. If there's anything you need, questions to be answered, suggestions you have or if you'd just like to check the best approach for your next project, just call. As well as giving you access to a great online resource, we also know a thing or two about how to manage an effective and successful selection. Contact our consultancy team to discuss your next brief. Want to get your team up-to-speed on the platform and realise quick wins for your next process? 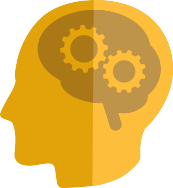 Book a training session and we’ll take you through all the key features so you can start fast. We help clients find agencies with happy customers. Recommended Agency Register is the place where clients look for trusted, high-performance agencies. 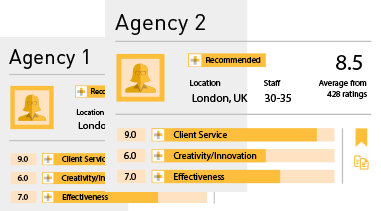 Register for free, and your agency gets rated for the great work you do. Upgrade to full membership, and those ratings form the bedrock of your comprehensive agency showcase. Unbiased performance data. It's the holy grail for clients looking for their next agency. At RAR, we've got it by the server-load. Which makes us the perfect independent platform to hook you up with more clients. No fee to join, pitch or get recommended. Just a simple membership if you'd like one - so you get noticed by more clients you'd like to work with. Plus awards, certificates and membership branding to help you stand out. Be brilliant. Get rated. Bask in the glory. When you join, tell every client to visit the RAR site and anonymously rate you. All it takes is a few minutes. Get enough ratings, and you're recommended. Understand where you're going right. (And the opposite, too). Ask the client to rate your work when you finish a project. It's a powerful insight into your team and agency performance. It's also a handy tool for client reviews and team appraisals.